Dwight: Jim is in charge of Stanley only in sales relate matters. Hence the green line... green for money... sales... get it? Dwight: There is this yellow zig zag that does give Ryan the authority to discipline Stanley. Dwight: However... in so doing... it zigs past your name hence zagging you and making you appear weak. Thus the yellow color... yellow for cowardly. 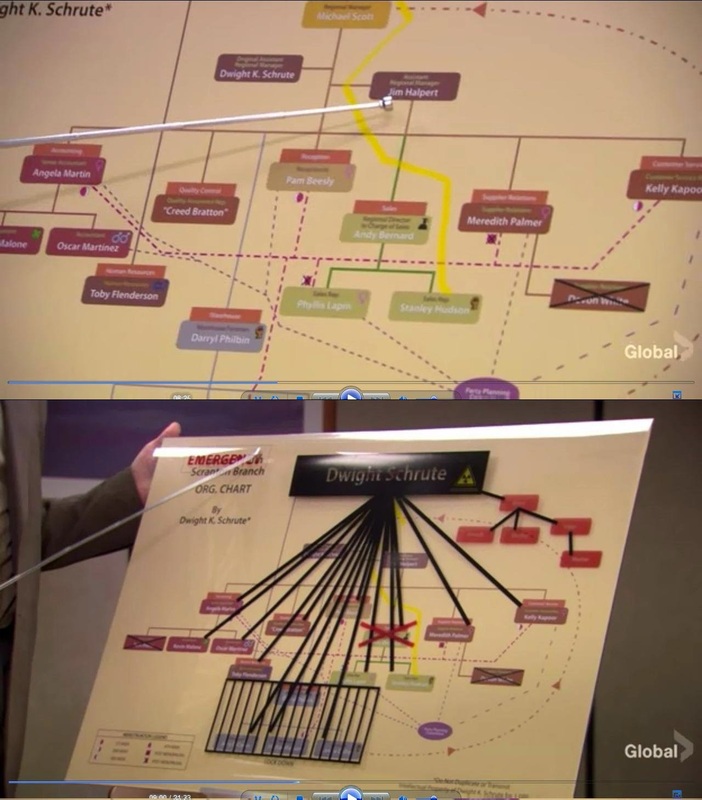 Dwight: Well there is the emergency disaster mode for the org chart. This gives me full authority over every single person in the office. Michael: I never said you could do that. Dwight: All you have to do is say it. Michael: Ok... I'll think about it. Allright well... you 're going to have to deal with this yourself. Found Here: The Office Season 4 Episode 12 "Did I Stutter"